I’ve been getting headaches and migraines. My neurologist wanted me to go on more medications that will help me with the headaches and the migraines. She wrote the prescriptions and was about to send me out the door. Wait a minute. Can I try something else? Is there something that I could be doing or not doing? Something that I could be missing that could be causing these headaches? That’s when she asked about my diet and sleep patterns. Now we’re talking. Before I add any medications to my routine, let’s see if we can take care of this issue proactively, rather than re-actively. 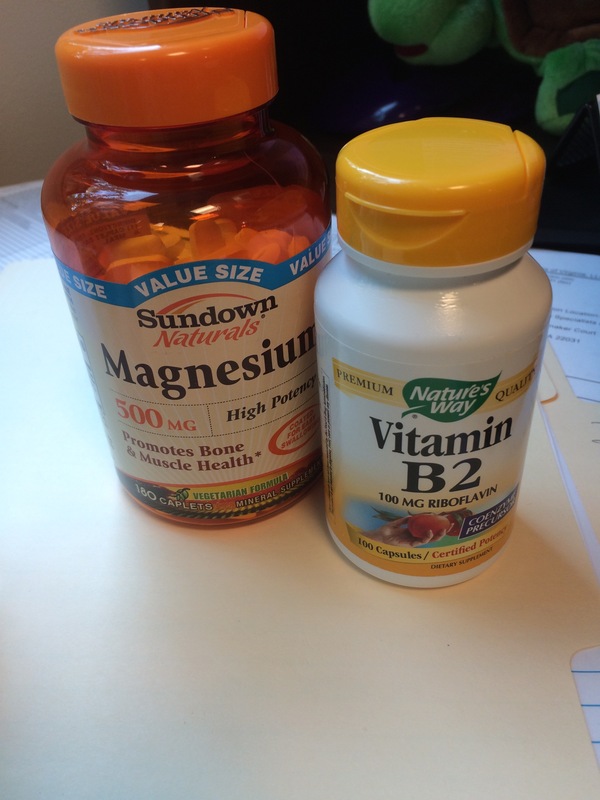 My doctor told me to start my increasing my intake of Vitamin B2 (Riboflavin) and Magnesium. She wanted told me to take 400 mg of Vitaman B2, which is 23,528% your daily value! and 500 mg of Magnesium, which is 125% your daily value. I asked if there was a way to test if I was low in these vitamins & minerals before I started taking mega-doses, she said that typically they don’t test for this. She said the super dose won’t hurt me… I will have expensive pee though! She also suggested that I create a headache diary, tracking my sleep patterns with my headaches to see if I can coordinate the two. I’m currently looking at a few different Apps in the Apple Store, there are so many! As you can see, a lot of these foods are overlapping in both categories! I won’t have a problem adding some of these items to my diet (dark chocolate & avocados.. yum!) but I’m not a very big meat eater still, so I will be adding the supplement recommended by my physician. I am also going to be more conscious of my sleeping habits, and make more of an effort to get the magic 8! I also saw a post about a 20 day headstand challenge somewhere? What if all I need is a few minutes upside down everyday? For the nervous system, I think you mean B2 (as in your picture), not B12. Magnesium can be helpful in migraines, but you need very large doses. In addition to a sleep diary, keeping a food diary and exposure diary (to chemicals such as pesticides) can also help identify migraine triggers. You’re correct! I mistyped it! Thanks for the catch & thanks for the tip!